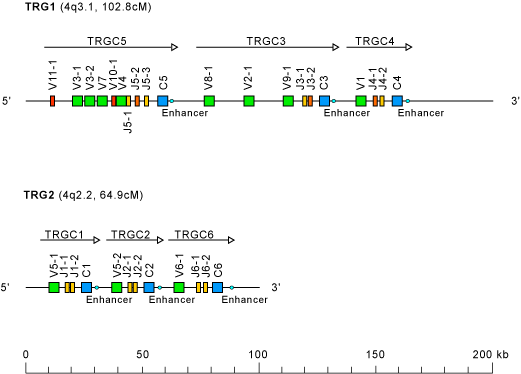 the TRG1 locus at position 4q3.1 (102.8 cM) spans about 150kb and comprises three TRGC genes (TRGC5, TRGC3 and TRGC4), each TRGC gene is preceded by one or several V genes and J genes . 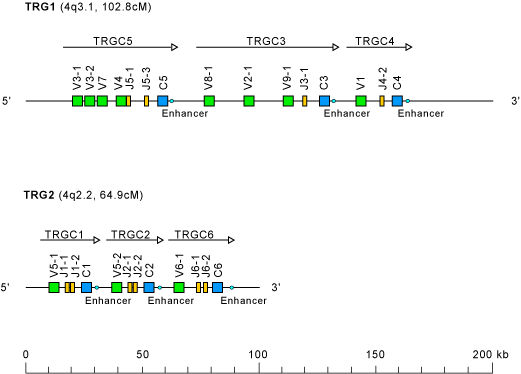 the TRG2 locus at position 4q2.2 (69.4 cM) spans about 90kb in sheep and comprises three TRGC genes (TRGC1, TRGC2 and TRGC6), each one preceded by its own set of V and J genes. . The TRG1 locus at 4q3.1 is syntenic to the human TRG locus at 7p14, whereas the TRG2 locus at 4q2.2 is a peculiarity of the cattle and sheep. Arrows indicate the TRGC cassettes and the transcriptional orientation of their genes.